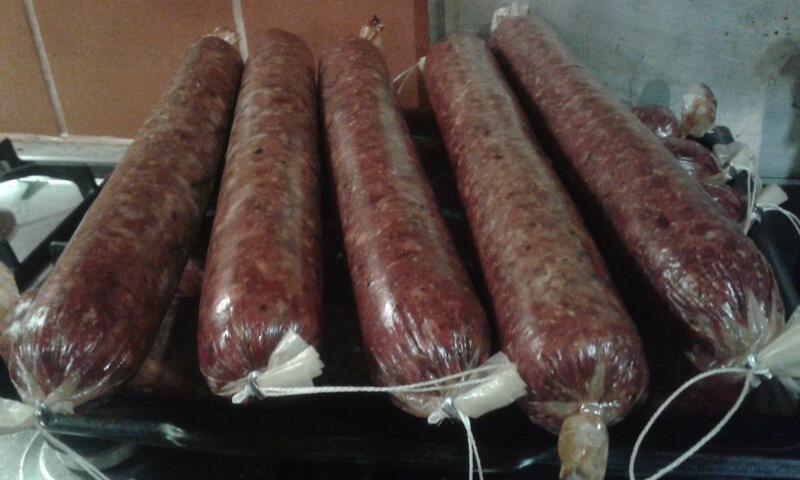 Wild Pork and venison salamis and lamb and venison sausages. Cold smoked then finished in the oven. veitnamcam, EeeBees, BRADS and 5 others like this. Bit of a how to? 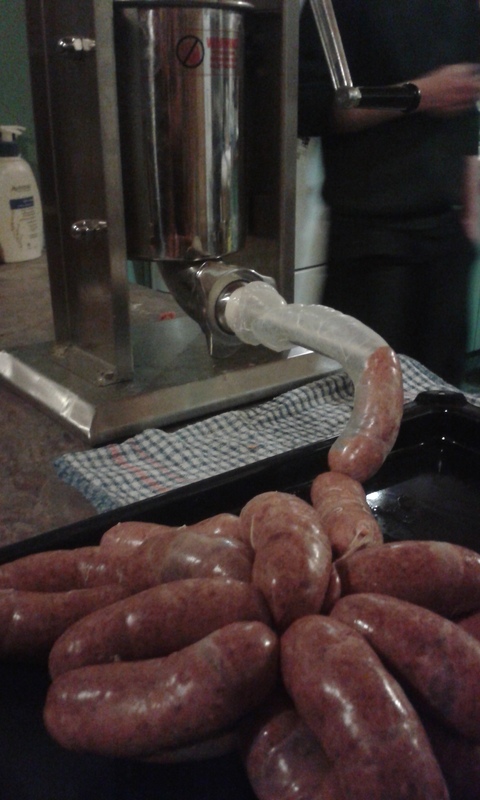 ok as requested.... not sure which parts wanted explaining so heres what we do anyway for sausages. Bone out meat into strips, removing the tougher silverskin and avoiding the really gristly meat (shanks) and fat. kept the lamb in the mix fat pretty lean. Run thru the mincer using a coarse plate, mixing well. Add the saussage meal, seasonings etc Packets reccommend 80 -90 grams per kilo but we use it at about 60 grams to the kilo as we prefer a meaty snag not a meally one like the supermarket. For venison we also use the pattie mix - makes veni mince or patties edible without having to empty the whole pantry of seasonings and salt. 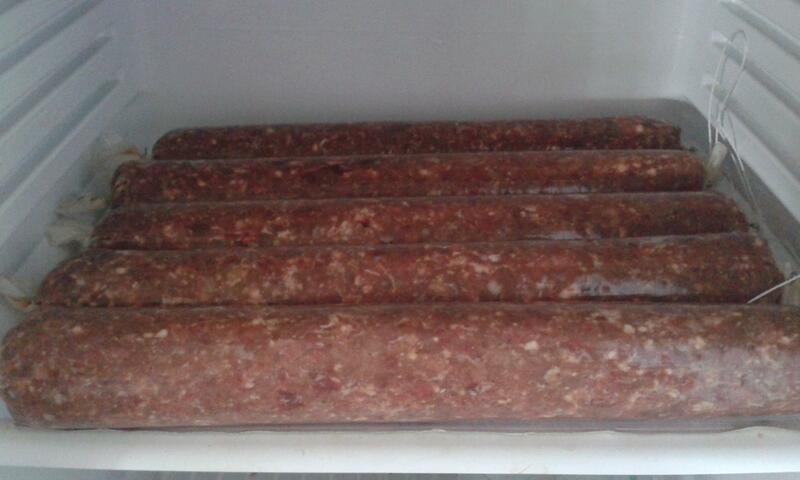 This time we used a mix of patti and sausage meal 60/40% weighed out but mixed into the meat till it looked right. Putting the mince into a big plastic bag made it easier to mix the meat and meals than having it previously in a big tub. Put mix back thru the mincer using a finer plate - providing it can be found grrrr ours went thru the coarse plate twice after boy looks AND mum looks couldnt find the finer plate. Odd bit of extra texture but thats ok.
my dad was the manager of Dunninghams Rotorua, very handy when it came around to making patties (favourite) and mince, sausages, and sausage meat. Has anyone tried duck salami before,my son and got some duck breasts in freezer dont know what to mix it with or do just take all to a butchery and they sort it. How much duck breasts you got hv. ok thanks better weigh up what we got. Ok thanks for that,i think better weigh it up. they may ask if you used steel or lead also parrie goes well to. they,l add pork fat to the mix and say you dont want the breasts ground to fine. you usually have a choice of garlic and pepper or even more. watch out for the spicy som,e can be toilet role in the freezer spicy. 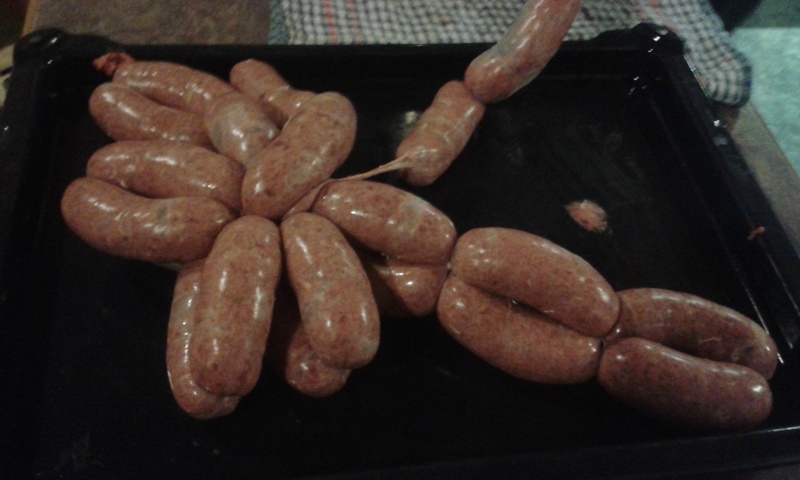 the bird meat sausages are better baked than fried imho as they cook more even and you dont end up with raw in the middle or overcooked on the outer. 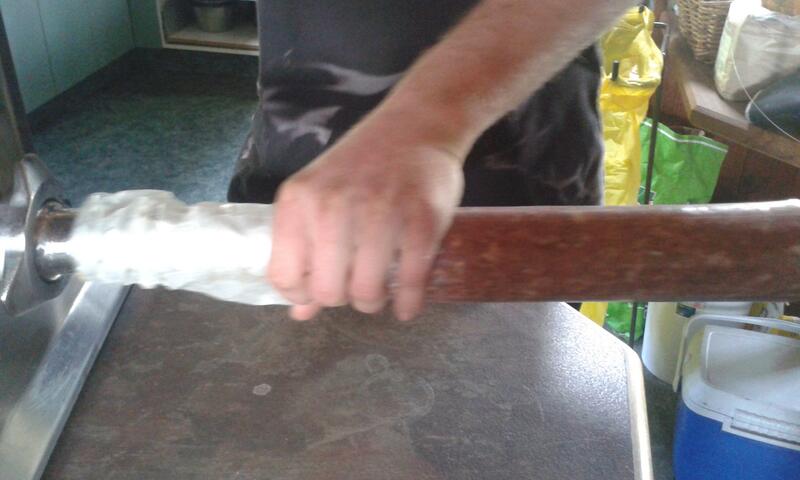 Gsp followers goose salami -it'llgive an ameoba a rajah if it ate enough -bloooooooddddddyyyyy delicious! 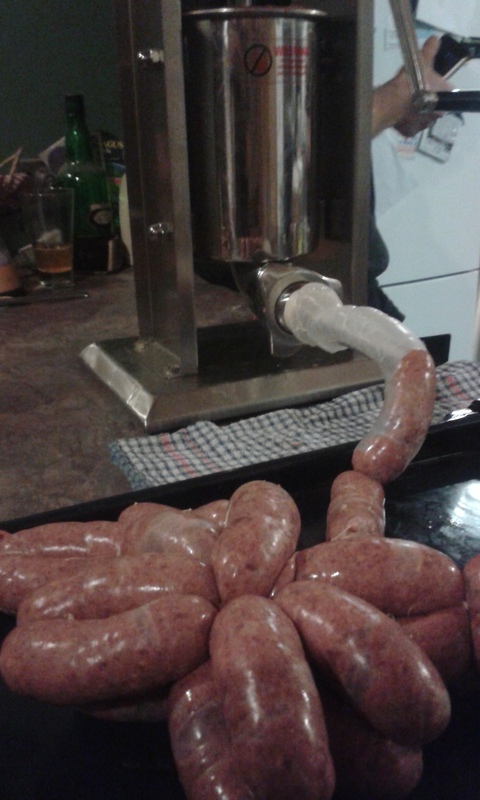 goose sausages just as good but the need a bloody robust fry .no pussying around! try duckbreast sausage rolls- make ya sausage rolls but instead of 100%saussie meat -1/2 the mix and add a duck /goose breast or two. rip into em but dont blame me if you start eyeing the pet budgie up like a randy mallard drake or an old gander! "It's like wrestling a pregnant tapeworm in the kitchen sink" - gold!